On March 21-23, 2016, the 31st annual Collaborative Conference for Student Achievement featured a gallery of professional learning and information sessions for educators, policy makers, innovators, and community members with an interest in innovative practices to improve educational outcomes for students. The conference featured 250 sessions with tracks for K-12 learning standards, K-12 online and blended learning structures, policy, research, accountability, student engagement and more. NCVPS had six staff who presented at the conference. 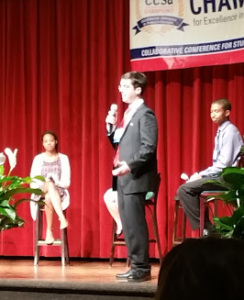 NCVPS students Arinton Davis, Sophie Pacyna, and Benjamin Succop were guest speakers during the conference and were recognized by the Department of Public Instruction as Champions for Excellence in Teaching and Learning. The purpose of the Champion Award is to share the collective belief in the power of public education and to celebrate everything that is right about our local schools and the people who make it so, every day. The highlight of the conference was the student panel. 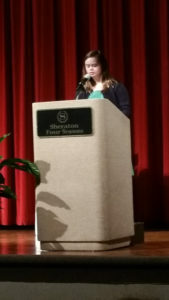 Our three NCVPS student representatives took the spotlight with their narratives. 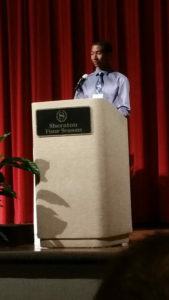 Arinton Davis, a West Forsyth student in Forsyth County, took his first NCVPS course while in middle school. “I enrolled in Algebra I and Geometry with NCVPS. My enrollment in these NCVPS courses permitted me to complete courses that were not offered by my middle school and allowed me to schedule Honors Algebra II, Biology Honors, and Chemistry Honors during my freshmen year of high school. After successfully completing his NCVPS courses, Arinton became a volunteer tutor with the nationally recognized NCVPS Peer Tutoring Center. He later became a Team Lead and Lead Tutor with the Tutoring Center. Benjamin Succop is a senior at Freedom High School in Burke County. Benjamin is a member of his school’s marching band, the quiz bowl team, the math team and the Key Club. He earned a perfect score on his ACT as a junior. Benjamin has taken a number of NCVPS courses and is a contributing blogger to the Department of Public Instruction’s website. NCVPS would like to congratulate Arinton, Sophia, and Benjamin for their great work, and we wish them continued success!